Mollie's Story -- Will you help? 06/05/2011 -- We couldn't ask for a better ending!!!!!!!! We are excited to announce that Mollie has found her 'furever' home! She is a happy, healthy pup who is doing great at her new home. Mollie and RCHS can't thank everyone enough for everything you did to help get Mollie the treatment she needed, and the chance to live a fun filled life, heartworm free. Please make sure you give your dog heartworm prevention, so they don't have to go through this treatment. RCHS also wants to thank Mollie's foster mom, Kassie. She looked after Mollie during her treatment and made sure she was as comfortable as possible. 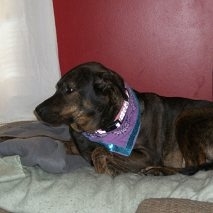 Mollie was very fortunate to have Kassie as her foster mom, while she recovered. Thank you again for all your support. Endings like this is what our organization strives for, but we couldn't do it without your help! I have been retested for heartworms, and my test came back negative! Because of all the great help from people like you, we got those nasty heartworms. I am now officially treated, and back to my active self. I am regularly attending adoption events, and looking for my "furever" home. We really can't thank you enough for all your support, while I completed my treatment. Heartworms are preventable, so we encourage you to give your cats and dogs preventative treatment. It is much easier and less expensive to prevent heartworms than to treat them. Please visit with your veterinarian regarding prevention treatment, and make sure your family and friends are aware of these terrible parasites. If you have any questions or concerns, you are also welcome to contact us. info@rchsks.org. Hey Everyone! Life couldn't be better for me! For the past few weeks my mom has been taking me to the dog park on a regular basis and I'm loving it. I love meeting new dogs and playing with everyone. After I've been playing for awhile, I still get pretty tired but its getting easier everyday! This week I get retested for heartworms with the hopes of my test coming back negative. Other than all that, I've been attending adoption events and meeting lots of families. Hopefully I am finally in good health so that I can find my new "furever" home! Hey everyone! !, I am now on week 4 of my heartworm treatment and am doing excellent. My mom has let me do a few more activities that I haven't been able to do, which is helping me with be less anxious in the house. I've been able to go outside for longer periods of time to explore and take in the sun and have been going to the dog park to watch my foster brother and sister play. Its nice to get outside, I love it!! I also don't have to be kept in my room when mom is gone, so I get to hang out in the house. I still have to be pretty inactive, which is okay because I get pretty tired after a little bit of activity. My mom has let me return to adoption events with the Humane Society so I can meet people and hopefully find a forever home! I still have about 4-6 weeks left of treatment and will get retested at about week 8. This week I will recieve my last bit of medication, my Ivermectin, which should help kill anymore worms left in my heart. Hello everyone...this is Mollie. I wanted to thank you all for donating, so I can start my treatment for heartworms. I have completed my first two treatments for these nasty worms. All things considering, I am doing well. My foster mom, who is taking great care of me as I undergo treatment, made me a homemade pillow for my kennel. I absolutely love this! The pillow helps me relax and be comfortable while I rest in my "room." Since I am suppose to remain inactive during my treatment process, I haven't done a whole lot. There are times I am anxious to get out and play with my mom, but that will come with time. We will be adding pictures soon so you have an updated picture. Everyone's support has really helped me through this process, and I am looking forward to attending events with RCHS in the future! Mollie is a 3 year old labrador mix who was recently surrendered to the Riley County Humane Society by her family, because they had to move and were not able to take her with them. She is an extremely great dog who enjoys playing, cuddling and being loved. She likes going on walks, playing with other dogs, and interacting with everyone around her. Mollie recently tested positive for heartworms and requires immediate attention. The treatment for this condition can cost upwards of $600 to $700 depending on the severity of the condition and how she responds to the treatment. This cost includes blood work to examine the functionality of the kidney and liver, x-rays to view the severity of the condition, and medication to help with the side effects caused by the treatment. For those of you who aren't familiar with heartworms, they are a parasite that spread from host to host by mosquitoes. There are many life-stages of this parasitic roundworm and eventually reach adulthood in approximately six to seven months. Once the worms reach adulthood, they reside in the pulmonary artery of the heart. Once here, they mate and reproduce, causing microfilarie to be released and travel in the bloodstream, where the life cycle is repeated. Heartworms can live for up to 2 1/2 years, and in some cases up to 5 years. Treatment to rid the body of this parasite includes two injections of an arsenic compound called melarsomine dihydrochloride. These injections work to kill the heartworms and microfilarie, which then must be absorbed by they body. Most of this occurs within the first week of treatment, so it is very critical that no physical activity or excitement takes place. This is crucial because the worms can become lodged within the blood vessels, causing many other complications. After the first week, the body undergoes a period of "remodeling and rebuilding" to fix the damage caused by the parasite, which can take up to six weeks. Once treatment begins, Mollie will also need doses of ivermectin, which work to continue killling any microfilarie and worms left in the body. With help in providing the much needed treatment discussed above, Mollie will be healthy in no time so she can get back to doing the things she loves! Even if it is just $5, every little bit will help.